Okay. So in my original post, I stated that my family loves to incorporate Asian flare into the everyday cuisine. 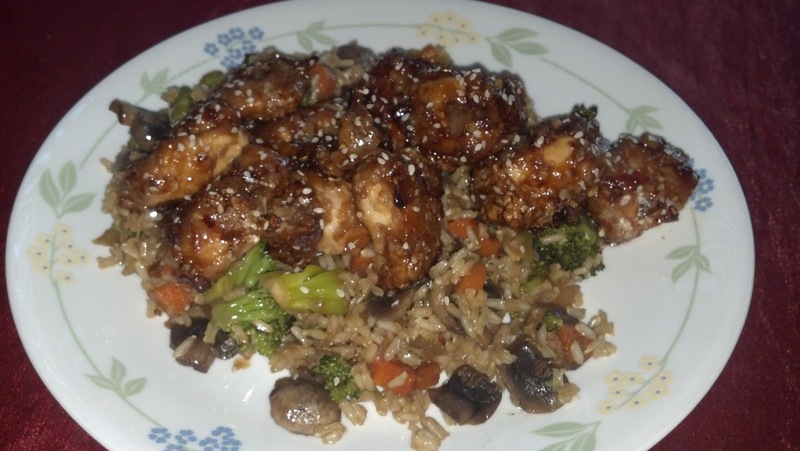 My husband loves Sesame Chicken but I do not like the thick, fried breading typically found with the dish. I decided to combine the sweetness of orange and a semi-sesame sauce to some baked chicken. The result was a DELICIOUS meal with minimal guilt! If you are serving more than 2 people, double the recipe for each additional 2 individuals. If you are working with bone-in chicken (as you know I am), remove the skin and debone. Once the meat is boneless and skinless, cut into 1 inch cubes. Place into a shallow bowl just large enough to hold the meat. Combine soy, marmalade, sherry, pepper flakes, ginger and garlic in a bowl. Pour approximately half of the mixture onto the meat. Reserve the remaining for the glaze. Refrigerate for 20 minutes. After the meat has marinaded, combine flour and sesame seeds in a resealable plastic bag. Remove the chicken pieces from the marinade and shake to remove excess moisture. Toss in the dry mixture and place onto a large baking sheet. Pour the melted butter over the chicken and bake for 20 minutes, turning the pieces over after 10 minutes. While the chicken cooks, pour the reserved liquid into a sauce pot and reduce by at least half until a glaze form. When the chicken is golden, remove from the oven and toss with the glaze before plating. Sprinkle additional sesame seeds for garnish. Note: I served this meal with a side of brown rice sauteed with stir-fried vegetables.